Who would have guessed that so many people had microwave science demos up their sleeve? I post one experiment about growing soap and the email goes nuts! Hey, people… maybe you should find a hobby besides sticking stuff in a microwave! Okay, I admit that I was more than amused reading through the ideas, but some of you are down right out of your minds. 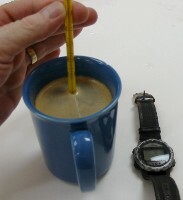 However, I ran across a great science fair project called [Cooling Coffee with Cream](http://www.wcsscience.com/sample/experiment.html) and it’s worth taking a look.